I did not turn 30 recently. But my friend Nicola did! Nicola Burrows is a coffee-drinking, book-loving associate pastor, a group fitness instructor and dance enthusiast. She’s also the inventor of the 30-olution list, which she’s introducing us to today. Welcome, Nic! I don’t remember when it all started, but my friends and I have been making birthday resolutions for several years now. Each year, on our birthdays we’ve come up with one resolution for the year ahead. Mine have ranged from the easy to complete – buy a pair of skinny jeans (a purchase I now regret), to the still incomplete – finish all my half-finished projects (oh, the irony). This year as I approached the big three oh, I had the grand idea of doing a countdown called ‘30 days to 30’ and each day I would do something to celebrate the end of my twenties. As with most of my grand ideas, it came to nothing! At my birthday dinner with close friends a new idea emerged. Since I’d missed the boat on the ‘30 days to 30,’ my friends suggested that instead of having one birthday resolution, I should have 30. 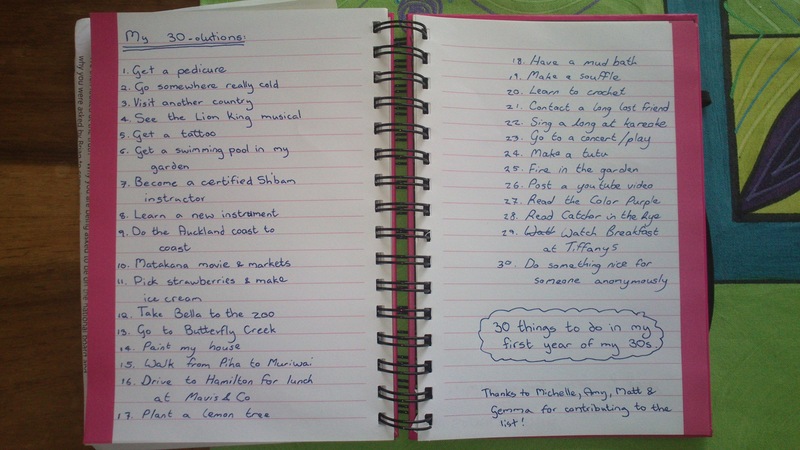 And so my 30-olution list began: 30 things to do in the first year of my thirties. Most of the ideas on the list came from my friends – though I used my veto power on the bungy jump and brazilian wax suggestions. There are a few things here that I was planning to do anyway, and for an achiever like me I needed to have a few that would be ticked off easily – like planting a lemon tree and seeing the Lion King. Some of the suggestions are things that I’ve wanted to do, but haven’t got around to. Like getting a tattoo, taking my niece to the zoo, making a soufflé and learning to crochet. And then there are some items of the list that I would never have thought of doing: picking strawberries to make ice cream and visiting the Matakana market and movies. So far I have only ticked off a few items. The lemon tree has been planted, I’ve watched Breakfast at Tiffany’s (which I highly recommend), I’ve been somewhere really cold and I’ve visited another country. I started reading Catcher in the Rye, but was still bored by page 30. Life is too short to read bad books, even if they are on your 30-olution list! The point of the list is not to tick everything off. I’m musically challenged so it’s unlikely I’ll successfully learn a new instrument, but I’ll give it a shot! The real treasure in having a birthday-olution list is the spice it adds to my life. As much as I like routine and order, I sometimes find my life becomes a little like groundhog week, where I’m simply reliving the same week over and over and the year slips by. My birthday-olution list provides ready made ideas of things to do to break up that routine. And having friends contribute to the list means that there are things on there that I wouldn’t have thought of on my own. An unexpected outcome of my 30-olution list came when I posted it on Facebook, along with updates of completed items. I found that others were interested and inspired to come up with their own lists. Looks like I’m not the only one who gets stuck in groundhog week! If you are feeling stuck and need a little spice in your life, why not come up with your own list. You don’t have to wait for your birthday, and it doesn’t need to same number of items as your age. I can definitely recommend Mavis & Co for lunch , it’s just down the road from where I live! As I too am past the three oh milestone I can’t directly copy this brilliant idea. This reminds me of a sort of goal we talked about in January this year which was to do something fun each month so we had some good material for a Christmas letter. Got off to a good start with a skydive in Feb but that has proved hard to match! I’ve also had discussions with family about “things to do before 40”. I feel a list in the making. I like the idea of having family or friends contributing. Yet another great list. Got me thinking about a ’40 before 40′ list…. Should aim high, I guess. 😉 I’ll start tonight.